Facebook’s latest attempt at stamping out fake news lets users know if they liked or followed any Russian propaganda pages during the US election. Its newest effort furthers its ongoing effort to stop the spread of misinformation while increasing transparency at both Facebook and Instagram. This follows recent revelations that Facebook was complicit in Russian election meddling after the company recently revealed to congress that propaganda had reached more than 120 million people during the 2016 election. 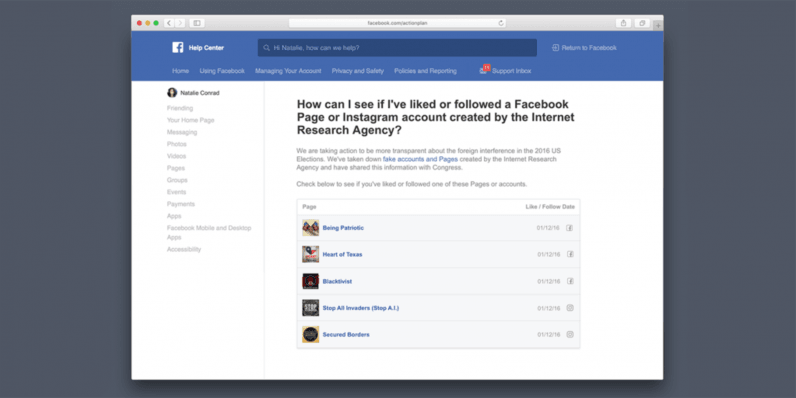 Facebook today said: “be creating a portal to enable people on Facebook to learn which of the Internet Research Agency Facebook Pages or Instagram accounts they may have liked or followed between January 2015 and August 2017,” which should be available to users by the end of this year. The Internet Research Agency is a Russian company which promotes the Kremlin’s interests through influence operations. Many of the fake accounts found on Facebook, Instagram and Twitter were controlled by the Agency, spreading erroneous information. Although the social media giant initially stated it wanted to keep itself separate from the content posted on its site, the numbers and results of the 2016 US elections made it impossible to ignore the problem.